Having successfully collaborated for many years with several Triballat Noyal’s brands, PRECIA MOLEN has once more been chosen for the quality of its offer that included a complete weighing system, with two R4S load receptors, and the super-efficient weighing indicator, the i40 IP69K. Designed and manufactured in France, the i40 IP69K indicator has ambitious objectives: offering a high level of performance and advanced features at an excellent quality/price ratio, with a unique design targeting the user’s comfort, and a limited environmental impact. Driven by constant growth, the family-owned company Triballat Noyal, located in Vilaine en Bretagne, that operates several renown brands such as Sojasun, NutriSun or Petit Billy, endowed itself in 2013 with a new production site in Noyal sur Vilaine for its VRAI brand. A leader on the fresh organic food market segment, VRAI is today the n°1 organic yoghurt and dessert brand in supermarkets, with a wide range of cow, sheep and goat dairy products. « We naturally turned to PRECIA MOLEN’s weighing solutions as they have proved their reliability and efficiency all throughout our collaboration. We are totally guided through by their local technical teams. », explains Fabrice Clément, New Works Technical Manager. A reference trademark on its market, PRECIA MOLEN relies on a dense network of 300 technicians over 42 sites in France. Its subsidiary PRECIA-MOLEN SERVICE offers complete services and timely interventions in compliance with regulatory requirements. Most PRECIA-MOLEN SERVICE’s sites are ISO 9001-qualified for the calibration, check, adjustment and repair of weighing instruments. Two R4S load receptors – lift platforms with stainless steel cylinders fit onto stainless steel frames – receive yoghurt and fruit containers as well as big-bag discharges. The i40 IP69K indicator transfers weighing data to a PLC that actuates the pumps in charge of discharging these containers’ content. 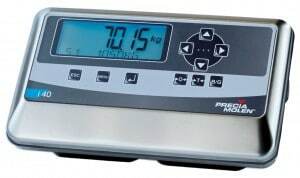 Easily integrated to all industrial processes involving weight measurement, this system offers numerous connection possibilities, including the PROFInet field bus, with a direct link to most PLCs and industrial PCs on the market. Containers’ content is discharged by pumps until an automatic stop happens, as defined by a given weight set point. An alarm then warns the operator that the container may be changed. These robust and reliable solutions imply little maintenance. With its simplified design, the R4 can be maintained by one person only, whether in a pit or not (load cells can be accessed without disassembling the platform). Especially designed for intensive use, the load receptor R4S is fitted with 4 shear beam load cells for optimal reliability and accuracy. The new technology of this infrastructure strengthens its mechanical resistance whilst reducing its weight compared to a traditional structure. As for the i40, its new large-size FSC colour LCD display offers numerous assets; it particularly offers users greater readability due to the absence of optical filter. The operator is provided with a main digital display and a multi-function alphanumeric display. The various backlighting colours can be selected to perfectly fit the working environment or to indicate the weight in relation to set points. The operator can then focus on only one point, which makes the organisation of his workstation much easier. « We are really happy with this weighing installation: we have not had any technical problem with it. », concludes Fabrice Clément.